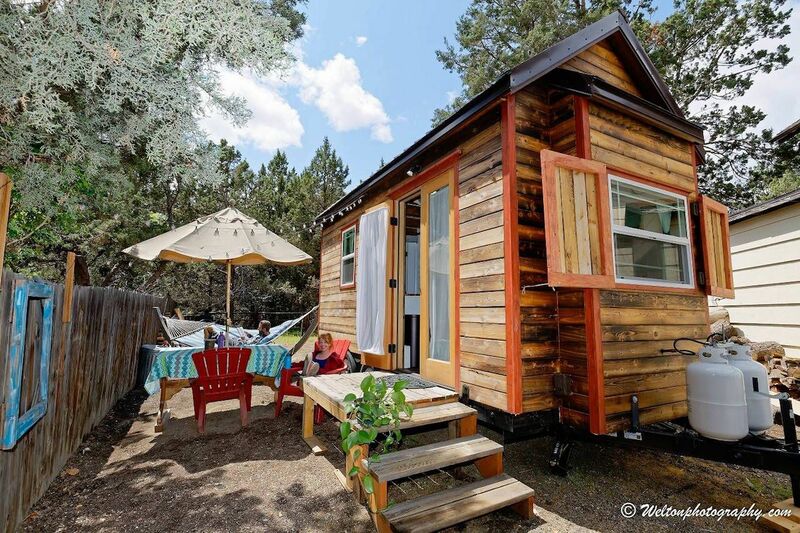 Tiny houses are a growing trend for vacation rentals. They’re very affordable, they can be placed anywhere from a tiny lot in a busy downtown to the middle of a forest, they’re better for the environment, and, of course, they’re incredibly Instagrammable and just as cute as can be. 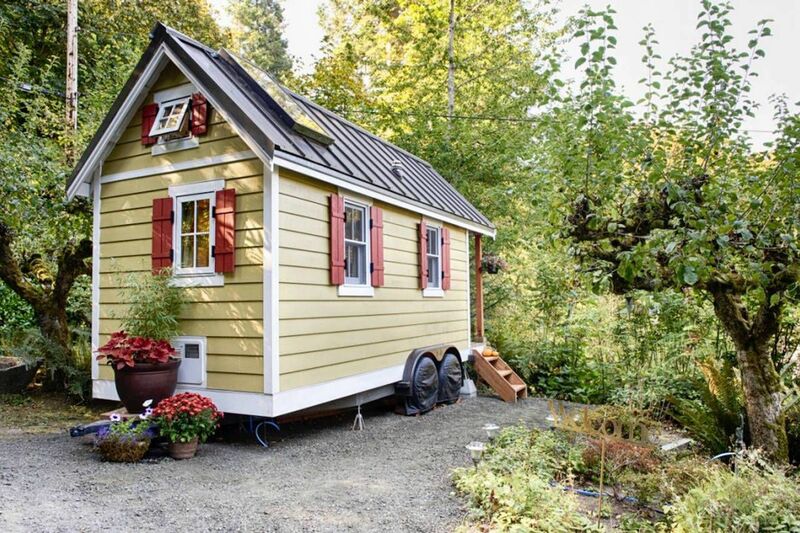 The prototypical tiny house looks pretty much like any house but on a miniature scale; most two-person models feature a kitchen, living room, and bathroom on the ground floor, with the bed housed in a loft space accessible via a ladder or staircase. Since they’re so small, many designers also use the chance to get creative with the design and concept; it’s also a welcome challenge in maximizing storage and space options to create optimal use of space. As such, these tiny houses are a huge hit in the trendy, outdoorsy, and eco-conscious Pacific Northwest, allowing visitors to easily explore cities like Portland and the mountain wilderness just a short drive away. If you’re looking for a vacation rental that’s a little different, here are the best tiny houses to stay in while exploring the Pacific Northwest. This coterie of eight tiny houses — styled to resemble abodes like a beach house, a bamboo shack, a barn, and a cabin — is ideally situated in East Portland, offering easy access to tons of great restaurants and breweries. These houses are truly petite: most clock in at 150 square feet, and the inside of each is perfectly organized and decorated to suit the themes. The Bamboo and Arthur tiny houses are especially delightful. Each house comes equipped with the requisite amenities like a functional kitchen and bathroom, and prices start around $135 per night. 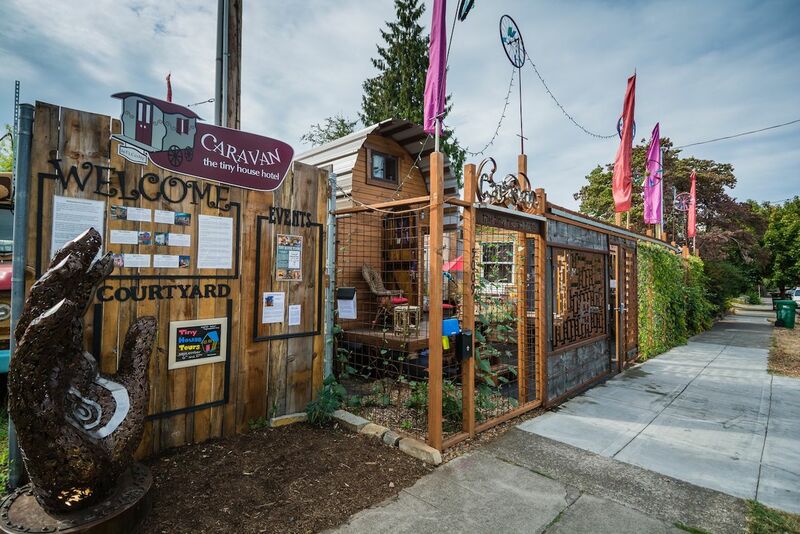 Full of all the whimsy and charm everyone loves about Portland, this hotel of six tiny houses is located in the middle of the popular Alberta Arts District. Featuring outside designs that range from funky caboose to hygge log cabin to the fantastical “Amazing Mysterium” (the outside of which looks like the traveling caravan used by the Wizard in The Wizard of Oz), the houses are all clustered around a communal space where, depending on the season, outdoor events like live music and s’mores over a campfire can be enjoyed by guests. This hotel is extremely popular, but even if you can’t get a booking, it also offers tours. All houses come with a fully equipped kitchen and bathroom, and rates start at $125 per weekday nights during the winter season. 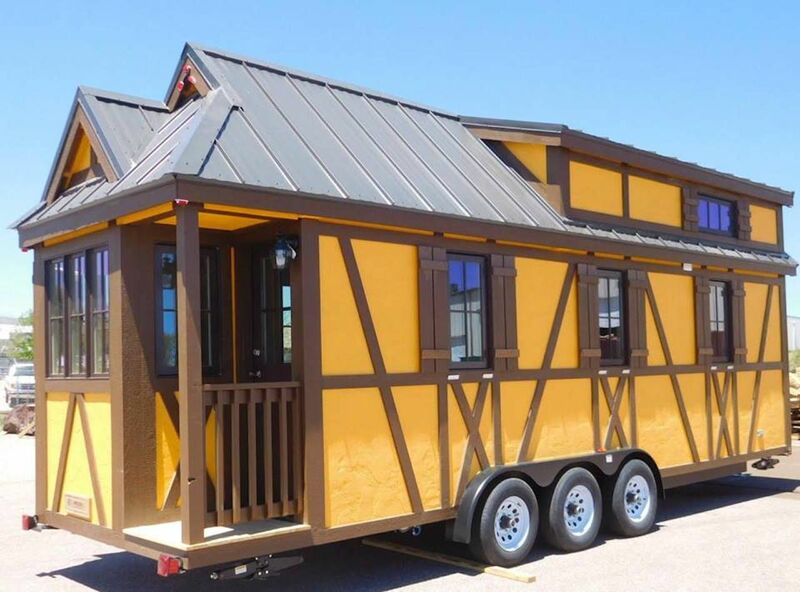 Photo: Tumbleweed Tiny House Co. This quaint tiny house village, located about an hour outside of Portland in the shadow of Mount Hood, is home to six different houses, each with a different name (like Atticus or Zoe) and “personality” style, ranging from rustic to Southern Belle. The postage stamp-sized lots and houses are impeccably maintained, and the site has great access to the surrounding wilderness as well as nearby Portland. The houses, which range in size from 175 to 260 square feet, come equipped with a fully functional bathroom and kitchen. Prices start at $139 per night. 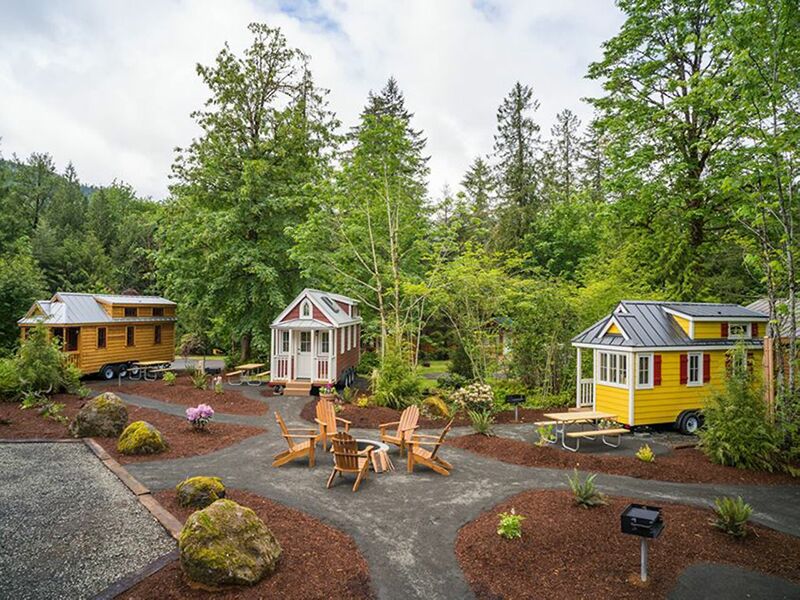 Made by the same company that built the Mount Hood Tiny House Village, these six tiny houses resemble the German-esque houses of the nearby town of Leavenworth, famous for its German-Bavarian architecture and atmosphere. Complete with tiny front porches, shuttered windows, and window boxes, each house also comes with a name (Otto and Rudolf are two examples) and its own distinct color such as yellow or purple. The inside of each, complete with bathroom, kitchenette, and decor, is tidy and a lovely spot to relax in the mountain wilderness of central Washington. Slightly larger than other tiny houses on this list, the biggest is around 300 square feet and prices start around $129 per night. Looking out over the picturesque Puget Sound, this charming tiny house is perfect for a wilderness getaway. The inside has been designed to feel airy and full of light, with wicker furniture, a tiny fireplace, all the amenities of modern life, and floral decor. You can walk to the beach via a private path, go on hikes, or go to Olympia which is located just a short drive away. $69 per night on Airbnb. 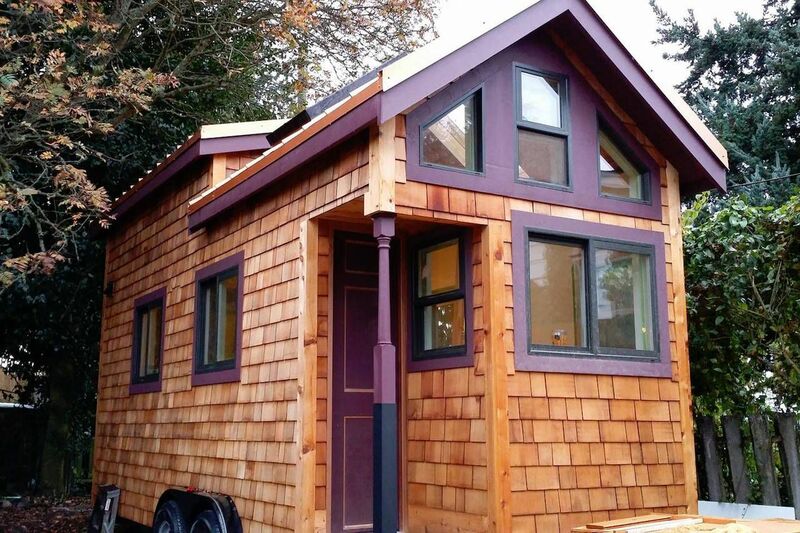 It doesn’t get much cuter than this tiny house available for rent via Airbnb in Seattle, covered with wooden shingles and burgundy paint accents on the outside. Inside, the space is functionally and tastefully decorated to feel like a home away from home, with plenty of books, a comfy double bed, and amenities like a kitchen, bathroom, and Wi-Fi. Owner Hannah is also a literal Superhost, going above and beyond to welcome guests with personalized notes; she also teaches a tiny house building class, so she can give advice about building and living the tiny house life. Listed as $40 per night. 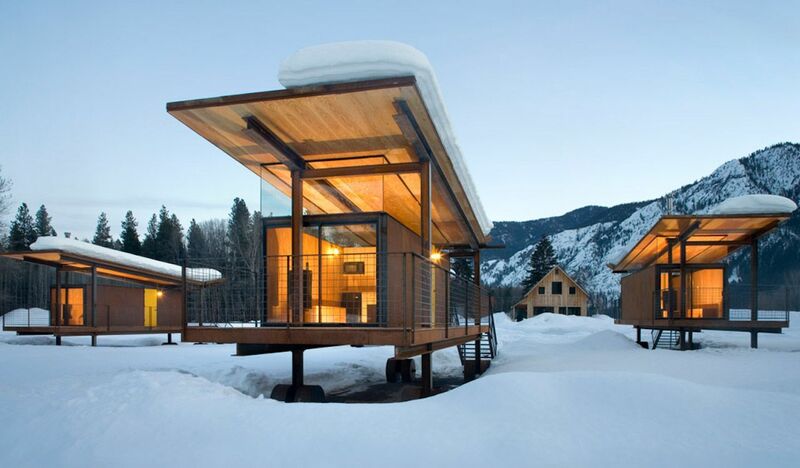 Located in Washington’s scenic Methow Valley, famous for its hiking, skiing, mountain biking, and rafting, these six tiny, evenly spaced-out huts look out onto a gorgeous high-mountain meadow. Elevated off the ground, each rectangular hut has high wood ceilings, block furniture, a wood-burning stove, and a large front window. The design is chic and modern, full of light, warm, and proof that less is more is a good glamping philosophy. Amenities include a fridge, attached toilet, showers in a nearby refurbished barn, and Wi-Fi. Prices start at $145 per night for two people. Tiny homes don’t just have to be a literal tiny house — they could also be mini-houseboats. 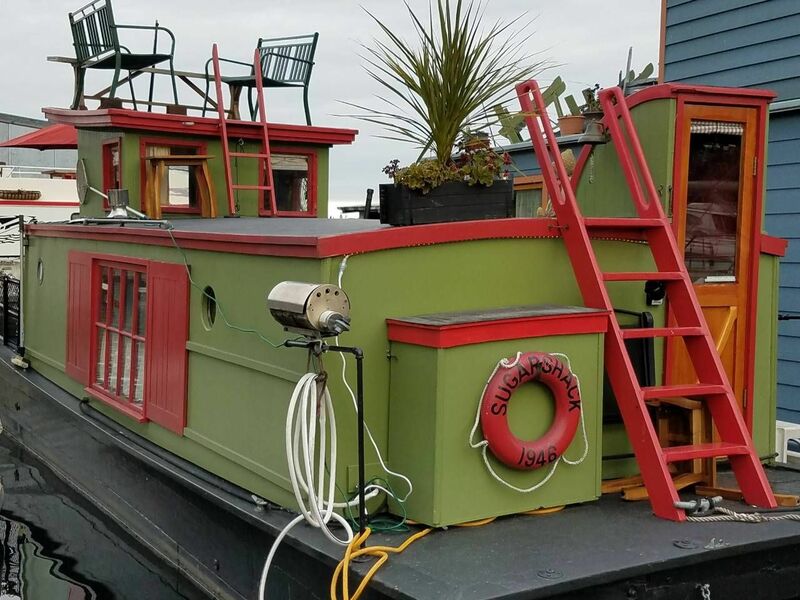 The waterfront of Seattle, Washington is home to several such tiny houseboats (including the famous An Artist’s Floating Dream, which is now for sale), but this adorable mossy green and red-accented beauty is one of the best. The boat comes with everything you could need, condensed into a small, floating space: kitchen, dinette, living room, queen bed, and a small bathroom (with a shower) as well. There’s even a space on top of the boat to set up chairs and enjoy the sun when the weather is nice. $109 per night. 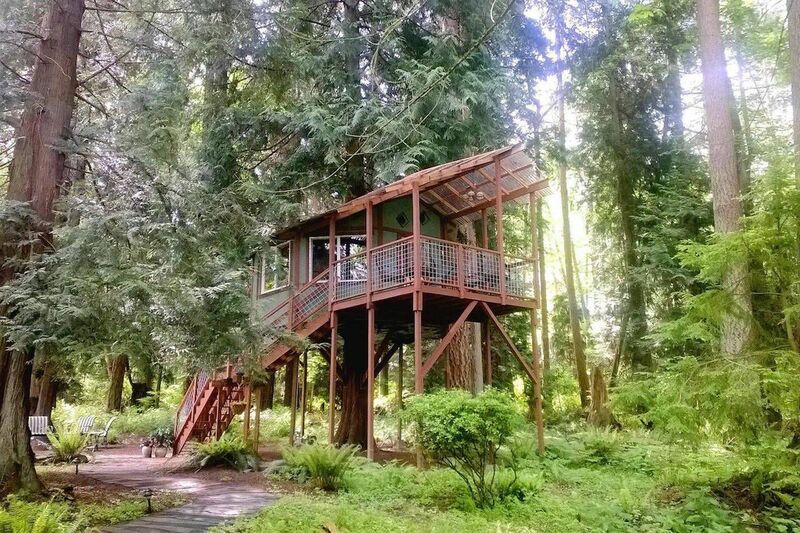 Located just an hour from Seattle, this elevated treehouse once again gives new meaning to the words “tiny house.” Clocking in at 250 square feet, the octagonal shape of the house, which stands 13 feet in the air around a mighty cedar tree, allows for wraparound views of the surrounding forest, and the cozy, heated interior features a queen bed, living area, and kitchenette. The bathroom is housed in a private shed at the base of the tree. $130 per night. 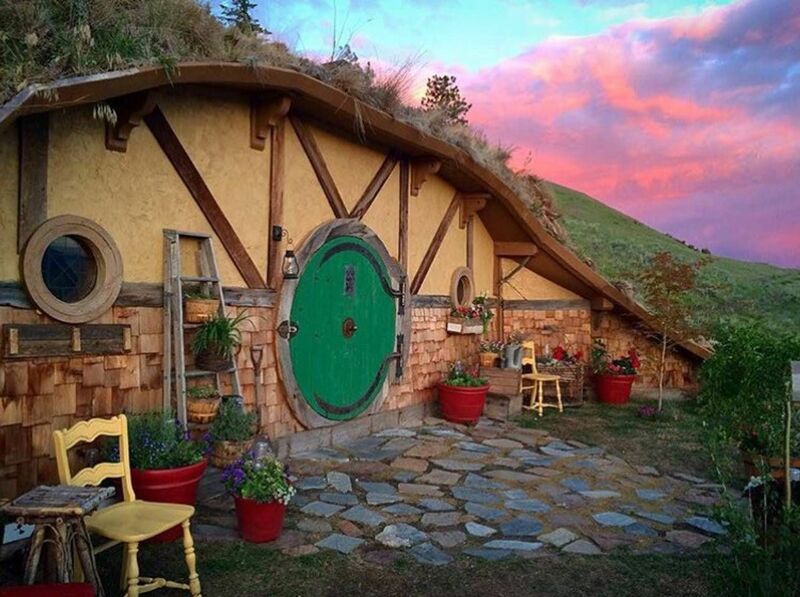 If you can’t make all the way to New Zealand to explore the real Hobbiton, this fantasy-world take on the tiny house concept is the next best thing. Set into a hillside overlooking the Columbia River Gorge, this 288-square-foot inventive hideaway — with the interior outfitted in warm wood and soft colors — comes with a spacious bedroom, bathroom, front garden area, and living room with a wood-burning fireplace, but no kitchen. A short path leads from the parking area at the bottom of the hill to the hobbit hole. $280 per night on Airbnb. 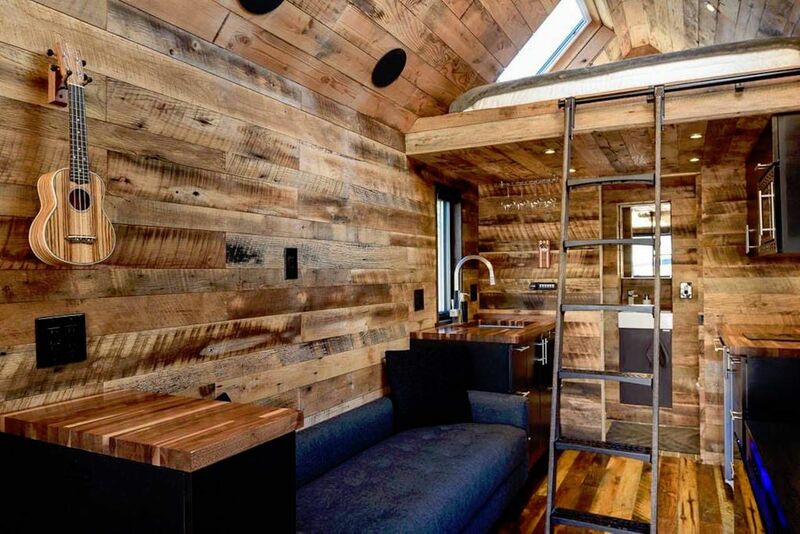 This tiny house, covered in gorgeous wood paneling on the outside, is a hipster’s dream abode while exploring the glorious outdoor wonders around Bend, Oregon. The ground floor comes with a kitchen, bathroom, and small living area, with the queen bed in the loft space. The interior design and decor are clean and quirky, with white walls and wooden accents on the counters, closets, and ladder, giving it a very open and airy feel. You can rent it for $99 per night on Airbnb. 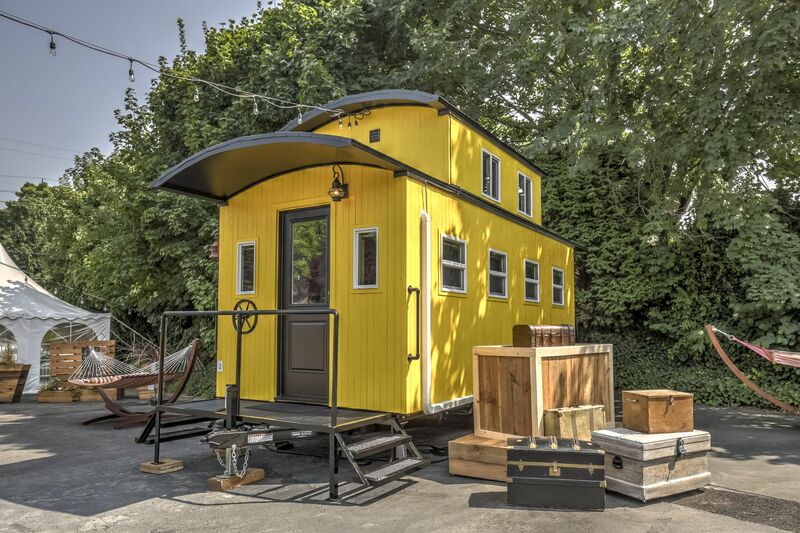 For the ultimate rustic tiny house experience, book a stay at this $69 per night gem, smack dab in the heart of West Seattle and mere minutes away from top attractions like Alki Beach. The design and decor is a testament to the understated and minimalistic, with sleek modern couches, amenities, electronics on the inside, and a stoop that lights up with a stencil of the house’s name. But it’s the wood of the house itself that makes this place such a treat to look at and stay in; designers Chad and Lindsay used reclaimed wood for both the interior and exterior, and it’s been restored and buffed up to glossy, warm-hued perfection. There’s a maximum of three people allowed.